Employee of the Month - March 2016 - Bond Clinic, P.A. Bond Clinic, P.A. 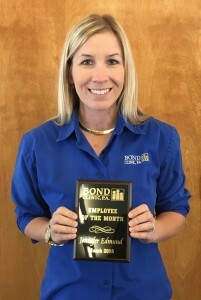 Congratulations to Jennifer Edmund for being selected as the March 2016 Employee of the Month at Bond Clinic! Jennifer is a Physical Therapist Assistant and works in our Physical Therapy & Rehabilitation Department. She began her employment with Bond Clinic in June of 2010. Congratulations Jennifer and keep up the great work!